These base pads are wonderfully made and fit very well to my SPS mags. Unfortunately with my STI Apeiro .40 they do not fit the IPSC box as advertised meaning I just wasted a lot of money on great base pads I can't use. Sehr gute Verarbeitung und Passgenauigkeit. Ein Highlight für jedes Magazin. Do not work in the standard IPSC box with a SPS Pantera .40 :( Heard an other guy with the same issure with the 9mm Pantera. Otherwise i love them. DAA Reply - you must check the height of your rear sights. Some very high seated sights are simply too high to fit in the box with these base pads. Got my base pads in no time after placing the order. They look great, they fit snugly on my Para mags, and together with the Arrendondo follower, they give me two extra rounds with enough space to spare to still make an easy reload with the mag filled to max capacity. I am very satisfied with this product from DAA, as with all the other stuff I have bought over time from Saul and his staff....keep up the good work guys!! Good quality. Fits the box with no stress. Right magbody and follower and you will have a reliable 19 round mag. I highly recommend this product. Altough these mag pads designed are to fit the IPSC box in Standard, I bought these for my Canadian open mags that were being built for 10 rounds only. This gives my spring just a little more compression area that make the 10 round mags reliable. These are well finished and mine are perfectly engraved with a number and Canada on the pad. Thanks for another fine product from Saul Kirsch and Double Alpha. These base pads are designed for 2011 magazines to fit into the IPSC Standard Division measuring box. They will, most certainly, be too long for the 140mm USPSA gauge when attached on 140mm STI tubes. Save €5.00 when you order the 4-Pack of base pads. You can mix and match colors as you like. The new DAA Aluminum Standard Base Pads are the result of a full year’s research. We studied all the base pads on the market; spoke to many top shooters; investigated which bases they preferred and why; and finally combined our own ideas with the best features of available base pads. 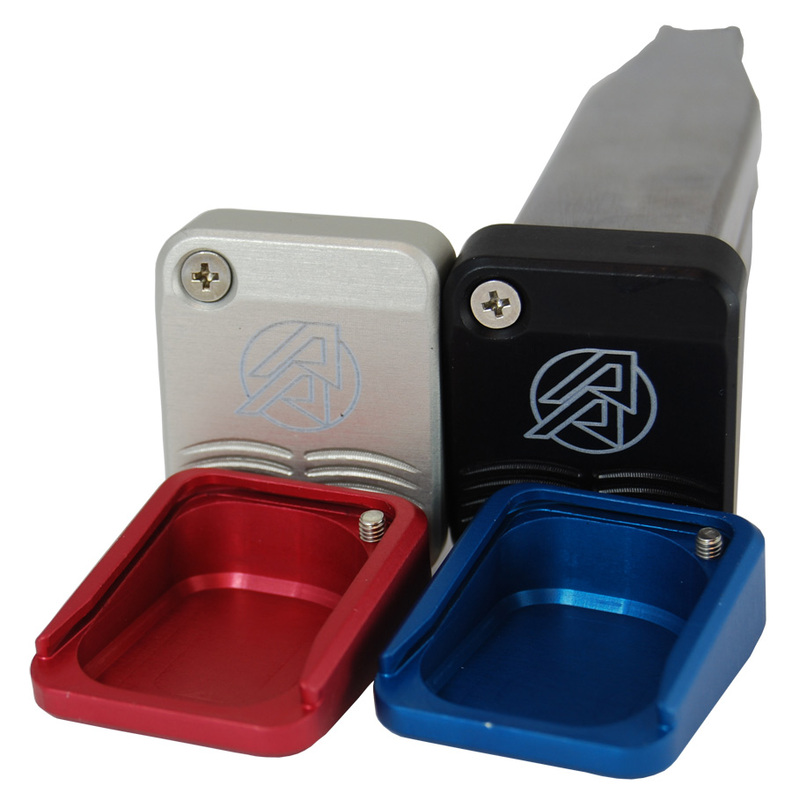 The DAA Aluminum Standard Base Pads are made of top quality aluminum, precision-machined to the tightest tolerances and hard anodized for extra strength and striking good looks. They fit snugly onto STI/SV/Para/Bul tubes, allowing just a little bit of that required ”wiggle”. Spring tension is enough to keep the pad in place; however, a self-locking set-screw has been added for extra insurance. The pad is hollowed out, leaving just the absolute minimum thickness to ensure strength and durability. Radiuses have been added to improve inner strength, and side walls have been thickened to further strengthen the grooves where the base attaches to the tube. In fact – these bases are so strong, we are offering a “No Nonsense” 5 year warranty! Available in Black, Silver (with metallic blue tint), Blue, and Red. Custom name and number engraving! Personalize your magazines by engraving your name on the DAA base pad. And/or order the bases numbered, so you can easily identify each magazine. €10.00 extra per piece. If you choose to add engraving, simply add a comment on your order, or email us with the name and/or numbering you want on the base pads. Name should not be longer than 8 characters! Allow a few extra days for delivery. SV Shooters, please note: The Standard magwell provided by SV is very narrow on the inside, and you will have to slightly modify either our base pads or the magwell to allow them to lock up in the gun. You will have to remove a little material for the top edges of the base pads, or widen the magwell.